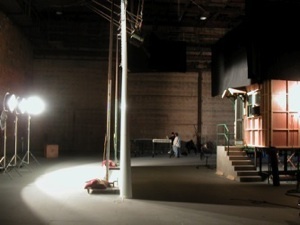 Translites are shown in use on a sound stage. Murph's Media makes translties. Translites are large, full scale photos of scenes that complete a view, usually from a window or a doorway. They are typically used on motion picture sets. Here is one made for the feature film Be Cool. 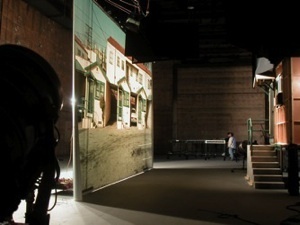 You can see the image of the cottages across the parking lot on the left of this picture and the stairs of the interior set on the right side. Translites are lit from behind. In this case, a series of floor stand mounted flood lights provide light. 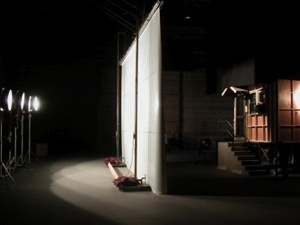 The background is hung from a bar suspended between two “sailboats” that are seen just behind the translte and which are weighted with sandbags. Production Designer Michael Corenblith asked Richard Lund to produce this background for the show. He provided these stills for use here to show how a relatively small background is hung and lit. This one was approximately 25 feet wide and about 16 feet in height.